Formby Pool is set to benefit from an injection of almost £1 million thanks to a donation from the Freshfield Foundation. 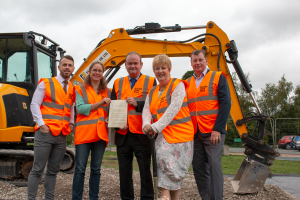 The Formby Pool Trust (FPT) and Sefton Council can now announce that the donation will fund an extension of the facility which will include brand new studio space, a larger gym and overflow car park. This will facilitate an increase in the volume and variety of classes available, while extending the footprint of the gym to allow for 13 pieces of additional equipment. This includes Technogym resistance and cardiovascular equipment, the same equipment used by athletes during the Olympic and Paralympic Games for the last two decades. Work commenced on Monday 20th August with the new facilities planned to be opened to members and the community in Spring 2019. “This is an incredible opportunity for the community in Formby and shows the true value of partnership work. “We are delighted to give £920k to Formby Land Trust for the construction of the extension and the overflow car park. “Our aim has always been to provide an outstanding environmentally and economically sustainable high-quality leisure facility, accessible and affordable to all, that improves local people’s health, wellbeing and quality of life. “The exciting project concerns a single storey extension to the southern end of the existing building to incorporate a purpose-built fitness studio, extension to the gym, and provision for additional overflow car parking.